The first step to planning a rehearsal dinner is to set the location and the budget. Sometimes the bride and groom will host the event themselves; others, their parents, friends, or family will host the event. Once you have determined who is hosting the event and who is paying for it, you can determine the rest of the details. Your location can be casual, especially if it will be in a different location than the wedding. Alternatively, you can pick a unique location for a fun, exciting feel. From a night out at a restaurant to a catered dinner at your home, the options are endless. Your budget will largely determine your venue options, but regardless of your location, you will want it to be a fun and social event for your wedding party and close family and friends. This will probably be their first opportunity to meet and get to know one another, so creating a fun, social atmosphere is crucial. After determining the venue and the budget, you can start to make your guest list. This list is a bit different than your wedding guest list; often, the rehearsal dinner only includes people who are actively involved in the wedding: the wedding party, your parents, and the officiant. You can extend the invitation to include close family and friends, especially if people have travelled from out of town or far away and will be in town for the day of the rehearsal dinner anyway. If the guest list is growing more than you expected, you can also opt for drinks and appetizers or catered hours d’ouevres instead of a full meal, which can help keep the price down while including more people. Since the guest list for the rehearsal dinner includes your wedding party and most important friends and family members, the rehearsal is a great chance for a fun, intimate night with a smaller group. Not only can you discuss the last-minute details of the wedding day, but you can celebrate in a fun, relaxed environment before the inevitable stress of the wedding day. Consider taking advantage of this opportunity and having a unique theme for the evening. If you are going out, this can include anything from bowling or mini-golf to a fancy restaurant or bar. For those hosting at home, you could have an outdoor barbecue for a summer wedding or a wine-and-cheese party if you live close to quality vineyards. By putting some effort into making the night a social event free of stress and anxiety, you can celebrate your wedding with the people closest to you and wake up on your wedding day fully-prepared for the event. It is called a rehearsal dinner, so the menu is a critical aspect of the evening. Depending on your budget and guest list, you have probably already decided whether you want a full sit-down meal, catered appetizers, or a home-style potluck buffet. Regardless of the structure of your dinner, the food is important. Many couples elect to have their rehearsal dinner at their favourite local venue or restaurant; not only will you love the food, but you don’t have to prepare anything yourself! If you elect for a home-cooked dinner or potluck, be sure to organize who is bringing which dishes in advance. The schedule for the evening can be as structured or as relaxed as you want. Some people prefer to design a schedule for the evening to ensure everything is accomplished on time and in an organized fashion. Others prefer to let the evening be more relaxed and treat it as a social gathering or pre-party before the wedding. 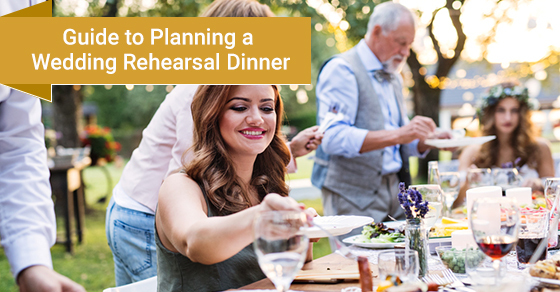 Once you have an idea of the kind of rehearsal dinner you want, it will be easier to design a schedule so you can be sure you accomplish everything you need to before the day of the wedding. For more structured dinners, be sure to be specific about when you are serving cocktails, appetizers, entrees, and rehearsing the wedding. Once you have the housekeeping issues out of the way, you are free to enjoy the evening with a little less stress. Some couples opt to open the floor to speeches, especially at more traditional and organized rehearsal dinners. In this case, it is customary for the bride and groom to make a short speech. This should thank the host of the dinner, as well as the wedding party and close family for their support. As well, this is a great time for parents, wedding party members, and other close relatives to say a few words. The rehearsal dinner is an important aspect of many weddings. At Chateau Le Jardin, we have the most gorgeous wedding reception venue in Vaughan that can accommodate all of your wedding and rehearsal dinner needs.